You are here: Home - General - How not to frame a tapestry. February 1, 2016	Comments Off on How not to frame a tapestry. This tapestry came into me requiring new glass. It had been stapled to a piece of 5mm MDF and a double mount stuck to it with double sided tape. The whole package to include glass was too big to fit into the frame chosen and was therefore haphazardly nailed and copious amounts of masking tape applied to prevent the nails jutting through. 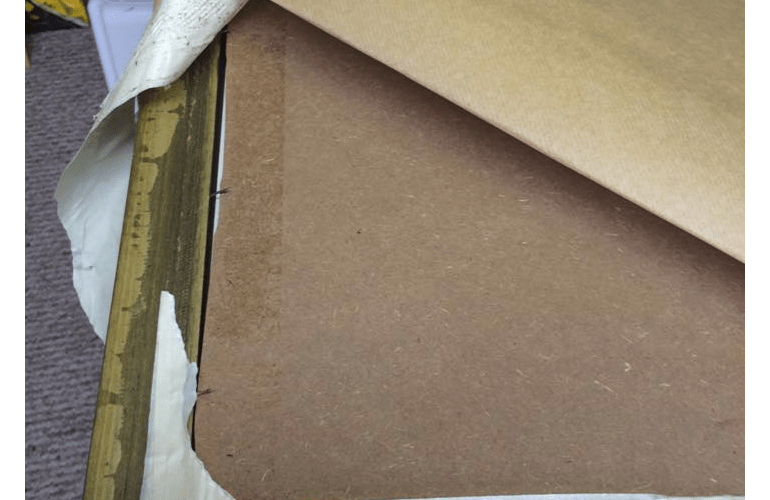 Finally a piece of brown paper was glued over the top and the wrong fittings were attached to hang it with. Believe it or not this had been professionally framed and they had even attached their label to the back.